A strange alien entity called Leader X lands his needle-like space craft somewhere in the Himalayan Mountains. There he takes what seems to be two human embryos to create a mutant called Berg Katse, whom he will use to create an organisation to take control of the planet. Some 30 years later, around the year 2000, a huge turtle shaped robot called Turtle King attacks and destroys a uranium facility. At a meeting of the International Science Organization (ISO) the delegates of the world’s countries discus this new threat. All are baffled at the identity of the new threat to world peace. Except for the top scientist at ISO, Dr Kozaburo Nambu, who surprises the gathered delegates by naming the secret organisation behind the attacks; Galactor. He further stuns the delegates by announcing that a special team of five young people, the Science Ninja Team Gatchaman, has been formed in order to defeat Galactor. As Dr Nambu is advising the delegates at the ISO of these developments, Gatchaman; Ken the Eagle, Joe the Condor, Jun the Swan, Jinpei the Swallow and Ryu the Owl, are hot on the trail of Turtle King in their God Phoenix craft. Hot-headed Joe is frustrated that their orders are to follow but not destroy the Turtle King. Realising that the Turtle King is headed towards a city, most likely to destroy it, leader Ken decides to sabotage the machine from inside. He takes along Jun and both of them take out as many Galactor agents as possible and then direct Ryu to fly the God Phoenix inside the Turtle King. However the commander of the Turtle King has seen through their plans and surrounds Gatchaman with hundreds of agents who fire on the team. But Gatchaman defeat the agents and the commander abandons ship in an escape craft. It seems Gatchaman has won, but Galactor turn off the Turtle King’s propulsion system causing it plummet towards earth before they can make their escape. Ken is forced to make the decision to use the firebird technique to escape. This is involves the God Phoenix seemingly transforming into a fiery bird, but causes immense stress on the ship and its crew. Using the technique Gatchaman escape the Turtle King before it hits the ground and kill the escaping commander in the process. Afterwards Dr Nambu is visited by a scientist from the country Hontwall. The scientist advises him that the Galactor will initiate the V2 plan; that is to force the Van Allen belt to descend so that radiation covers the Earth. The scientist suggests that the Earth should surrender to Galactor which raises suspicions in Dr Nambu’s mind that the scientist isn’t who he says he is. The scientist reveals himself to be Berg Katse and repeats the ultimatum before making his escape. Dr Nambu orders Ken to team up with the leader of the mysterious agent team Red Impulse in order to infiltrate the country of Hontwall. It is believed that the country’s defence minister has teamed up with Galactor in a plot to bring down the president. Red Impulse has been searching for evidence for this for a decade without success. Ken and the leader of Red Impulse manage to break into the defence minister’s mansion but are unsuccessful in blowing opening a large safe suspected of containing the evidence they need to take action against the minister. Later Galactor raid the president’s compound and take over Hontwall. Back in their hometown, the Gatchaman team take a break at a café run and owned by Jun. Gunshots are heard outside and Ken is surprised to see his old friend Sabu shot on the ground. Sabu has sustained only minor injuries and soon makes a full recovery. Sabu tells Ken that he thinks he may have found his long lost father, previously assumed to be dead, in Hontwall. Ken takes the decision to follow Sabu back to Hontwall to find his father, without letting his teammates know. However this is a trap set up by the country’s defence minister and Galactor in order to lure out Ken’s father, who they suspect of spying on Hontwall. In the meantime Galactor sets their V2 plan into motion, exploding a rocket in the stratosphere causing the Van Allen belt to descend and causing atmospheric chaos on Earth. Berg Katse give the world’s leaders an ultimatum; surrender in 24 hours or it won’t send a second rocket into the stratosphere in order to send the Van Allen belt to its original place. While the team are furious with Ken’s apparent abandonment of them in favour of finding his missing father, Dr Nambu still orders them to defeat Galactor’s plan. Unbeknownst to the team, Red Impulse have saved Ken from Galactor’s trap and have infiltrated Galactor’s secret base which is constructing rocket to correct the Van Allen belt. Ken advises the Gatchaman team of the base and Galactor’s plan is thwarted, but only after a terrible sacrifice is made to save the Earth. Galactor does not give up after this failure. They soon hatch an insane plan to destroy the Earth from within its own molten core. This release is such a welcome surprise. 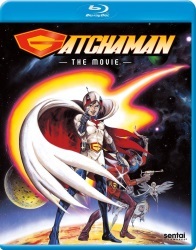 Originally released in 1978, this film is mostly a compilation of the “Gatchaman” TV series from 1972 to 1974 that Sentai Filmworks previously released on BD and DVD under their previous name ADV Films. The film comprises mostly of the finale of the first arc of the TV series (episodes 51 to 53) and the amazing finale of the series (the final three episodes, 103 to 105). Around 10 minutes of the first episode is tacked onto the start to introduce the characters as well parts of episode 31 to bridge the two halves of the film together. What’s most interesting about this particular feature is the four or so minutes of new animation, mostly dealing with Leader X’s arrival on planet Earth and his creation of Berg Katse (the latter told through some rather dodgy video effects matted back onto film stock). An additional minute or two of new animation conclude the film. Also new to the film is a new score from the NHK Symphonic Orchestra, though this is limited to a couple of new pieces which are recycled a number of times in the film. This film came at a very interesting time in Japanese sci-fi and animation production. The “Yamato Boom” had begun two or so years prior and seemingly had no end in sight. As a result anime fandom had taken its very first steps. “Star Wars” also appeared in Japanese cinemas that year, though local studios had already taken advantage of the film’s delayed Japanese release and produced and released their own cheapie rip-offs. You also had Sandy Frank releasing his own version of “Gatchaman” in the west (as “Battle of the Planets”). It makes sense that animation studio Tatsunoko would throw its hat into the ring and have a go as well. Apart from resurrecting the franchise via this compilation film, they also created a new TV series at the same time; the highly inferior sequel “Gatchaman II”. So how does the film fare? I’ve constantly said on this blog that I am no fan of the compilation anime film. Yet again this film has not changed my mind about them. And yet again the problem here is much of the plot and character development has been discarded in order to keep the story moving. Right from the start there’s problems. The 10 minutes edited from the first episode is meant to introduce the characters, but of course there’s barely any time to do that. The sub plot of Ken and his father is handled really well I admit, however in the second half of the film things get really messy. A highly important plot line involving an illness of one of the Gatchaman team members (trying not to give away spoilers here) is botched. The character in question keeps seeing flashes of light due to a brain injury and this becomes rather debilitating. However this is not explained at all in the film. The edited film gives the incorrect impression that the character is blinded by a spotlight and is easily captured, which is totally out of character for that particular team member. It is also implied that the injury was caused by a fall which doesn’t make a whole lot of sense within the context of the film. I wish Tatsunoko had expanded the film by another 10 minutes just to fill in some of the narrative gaps. The highlight of the film is of course the new animation. It totals about four or five minutes which includes the end credits. The new animation is of interest to most fans because it explains how Leader X and Berg Katse came to be. A post script also has Dr Nambu in voice over questioning the existence and origins of Leader X, which I thought was a bit too philosophical and out of character for Dr Nambu. Is this new material worth the price of the disc? I think it’s up to the individual. If you’re a rabid “Gatchaman” fan, yes, casual fans, maybe no. Bizarrely Sentai Filmworks have produced an English dub for this film. Considering the amount of TV series they haven’t commissioned dubs for, this seems a little odd. However they did re-release the original TV series on BD, so they must know something about the sales of the TV series when ADV released it on DVD. In Japan the film hasn’t been issued on BD as far as I’m aware. In fact the film was only available on DVD via mail order as a bonus to people who collected the TV series discs some 15 years ago. The Sentai disc contains no extras which isn’t all that surprising. For a compilation movie, it’s a bit of mess at times, however it’s fun most of the time and for me the new animation was very interesting. The plot with the Van Allen belt is kind of silly when you stop to think about it for a second, and the animation has aged. However it probably was the best animation on Japanese TV at the time. You can see the love and attention Tatsunoko poured over the series in every frame of the show. That said, this a bit of an average compilation film and unfortunately reminds you how much better the TV series was. 6.5 out of 10. Remaining Backlog: Eight series, 18 movies, six OVAs also waiting for second parts for two shows to be released before viewing them.